The majority of our products are available in bulk, and while there are very specific times that bagged products might work better, overall the preferred method of packaging for our products is bulk delivery. Once you’ve decided the type of product you need, the next step is to determine the quantity you need. Product coverage calculators are conveniently located on each product page. A note on coverage: The information provided here serves as a basic guideline for calculating product material coverage. If you have a newly filled area it’s a good idea to add an inch or so of depth to your total calculation as these areas usually settle during the first change of seasons. If you should have further questions, please contact us before placing your order, and someone will be happy to assist you with further product coverage calculations. Product prices noted indicate the cost of the item picked up at our farm which is easily accessible from major Connecticut highways. Should you have any questions regarding directions to our farm or our products please don't hesitate to contact us. If you would like to have the product brought directly to you delivery service is available for all our products at an additional cost. Product prices noted do not include tax and we are required by law to charge CT sales tax. If you have a business tax ID exemption, please visit our office and leave us a copy of your paperwork on file. Once you have left a copy with us for our records, we can waive the sales tax for future purchases. 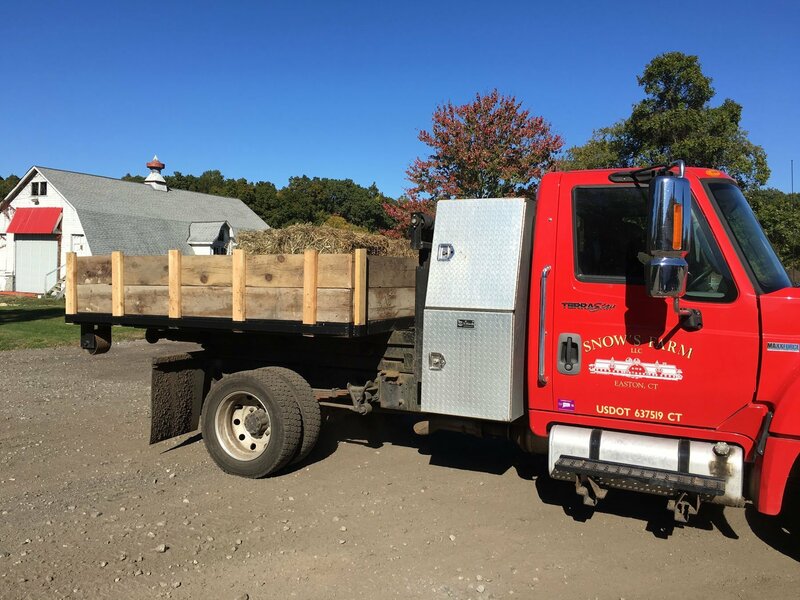 The deliveries are based on the maximum amount of product that the truck can hold, as well as the town/city distance from the farm. Delivery trucks can hold hold one bulk product at a time. Otherwise, products will get mixed together. For example, if you order Lawn Mix Soil in bulk, you cannot add a delivery of say Cedar Bark Mulch to it. You will end up when dumping with a blended Soil / Mulch Mixture! If you need bagged products or hay bales delivered at the same time of a bulk delivery, there is a limit of 3 bags or 6 hay bales that can be put on with your delivery. If you should need more than that, then an additional delivery will need to be done. All delivery prices are in addition to the price of the product, and will be displayed to you during checkout. If you are out of state or delivery prices are not available through the website, please contact us for additional information. Depending on the area where you want your material dropped, our experienced drivers will do their best to place it in a location suitable to your use. 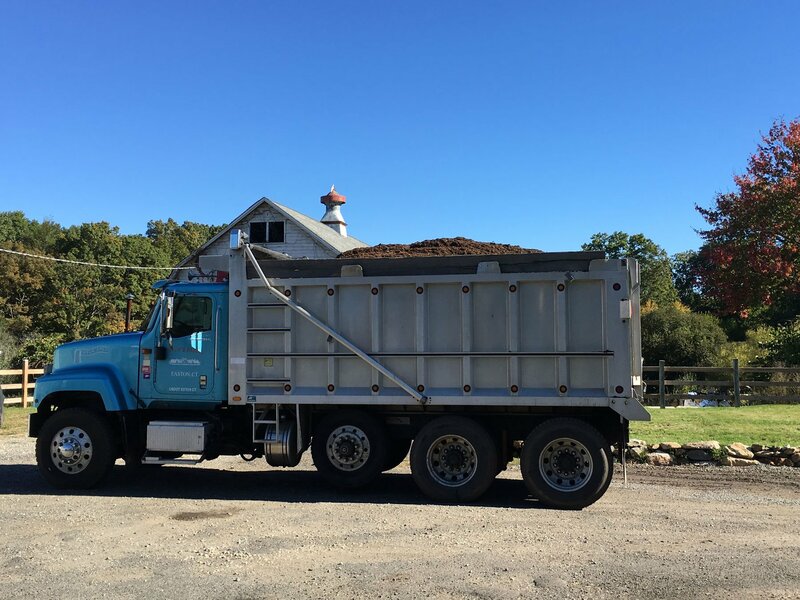 Because of wet areas on your property as well as other natural and man-made obstacles, Snow’s Farm is not responsible for any personal property damage resulting from deliveries where the property owner requests the delivery truck travel beyond the street curb. If the delivery is off the curb or driveway a Snow’s Farm Waiver for Liability for Damage must be signed. There must be no power lines / tree branches above the spot to be dumped. The delivery truck cannot drive over leaching fields or a septic system. A delivery can be made when no one is home under special circumstances; however the customer must sign a Snow’s Farm waiver and must also leave a detailed map of the area or stake out the area with a shovel in the ground or a bucket. The map or staked out area should be as detailed as possible. We are not responsible should a delivery be dumped in the wrong spot. Drivers try to accommodate as many reasonable requests as possible. Please allow 3-5 days advance notice for all deliveries. We reserve the right to adjust prices and or add a fuel surcharge to any deliveries. *Please Note – There will be times when our delivery trucks will be unavailable due to repair / maintenance and busy seasonal times. 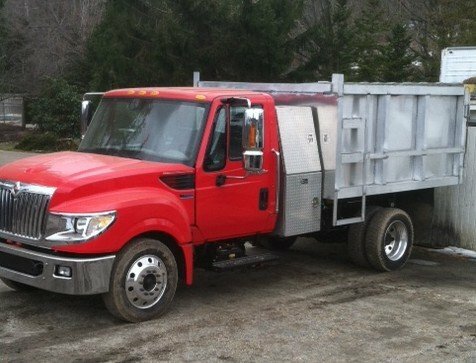 A similar delivery truck will then be used by our friendly and professional subcontractors.